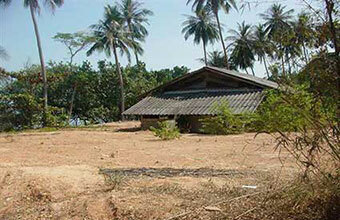 A 2 Rai Plot of waterfront land for sale in Dan Mai, on Koh Chang's north eastern coast. The Plot of Land has a small stony beach area, is approximately 100 Meters from the main road and has an access road leading to it. Water, Electricity and Telephone services are easily accessible. A prime waterfront location facing towards Trat. This plot of land would be ideal for someone looking to build a small resort or private houses. The plot can be purchased as 1 Rai Plots or outright.